Welcome to our website. Our mission is to provide our patients with optimal endodontic therapy in a calm, warm, and friendly environment. We will be working with your dentist to ensure that your problems are dealt with in a timely, professional manner. Thank you for visiting us! This website if fully capable of keeping all patients and referring doctors up to speed on every aspect of your treatment in our practice. Please feel free to take full advantage of the information available to you at any time. At the endodontic practice of Dr. Levin, we utilize the latest technology to help us attain our goal of providing you with optimal endodontic therapy. Technology such as the surgical microscope, digital radiography, and ultrasonics are some of the tools Dr. Levin will use to manage your problem. We will do everything we can to ensure that your experience in our office is as comfortable as possible. 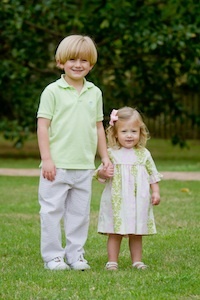 Meet Dr. Levin's son, John Austin and daughter Alice Gwendolyn! This was my third root canal, the first two being with other endodontics doctors and by far, Dr. Levin is the best in his field. I would like to thank Dr. Levin and his great staff for their professionalism, compassion to there patient's, and their dedication to their profession. I have already recommened Dr. Levin to my family, friends and employee's. Again, thanks to all who made my treatment as painless as possible. Services and staff were great. I have no more pain, thank you, Dr. Levin. I felt very comfortable in the office and pleased with results. I was referred to Dr. Levin by dentist. When I entered the office, I was greeted and felt very good about the staff. When I met Dr. Levin, he was so pleasant and explained his work thoroughly. My actual work went smoothly, and in spite of my anxiety, I felt comfortable with everyone. Dr Levin and staff were very kind, informative before, during and after my sons treatment. The compassion they showed my son (10) was very reassuring that they were concerned about him. Very SATISFIED customer. I want to thank Dr. Levin and his entire staff for the care that I recently received when I needed a root canal. Everyone was very professional, kind , and helpful. Now, I hope I will not have to have another root canal, but, if I do, I will have Dr. Levin do it. I would recommend him to anyone!!! Thank you, again!!!!!!!!!!!!!!!!! !